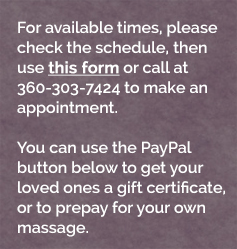 Welcome to Plum Massage, a website designed to make appointments, purchase gift certificates and learn a bit about deeper tissue massage therapy and how the muscular system of the human body works. Sunday/Monday/Wednesday/Friday 12 & 2, Tuesday/Thursday 2 & 4,. Prices are $50 for a half hour, $100 for an hour, and $140 for an hour and a half. Cash and check accepted at my office. To pay using a card, use the Paypal button below. Browse through the website to learn more about the work I do and how it works.